'THE RENAISSANCE PAPACY LIVES' - “The naming of Georg Gänswein as prefect and archbishop is a scandal,” was the reaction of an unnamed Church official at the Vatican. “The Renaissance Papacy lives,” he continued, accusing Benedict XVI of promoting his favorites (The Tablet, December 15, 2012, p. 4). The year 2012 closed with headlines announcing that Monsignor Georg Gänswein had been elevated to Prefect of the Papal Household and promoted to the rank of Archbishop. Seven years ago, when Card. Ratzinger became Benedict XVI, he brought his personal secretary with him. Given Fr. Gänswein’s athletic dexterity, he was aptly considered by many as the Pope’s bodyguard. In 2006 this bodyguard-secretary was granted the title of Prelate of His Holiness, which implies the title of Monsignor and the right to wear the purple sash and zucchetto. Contrary to custom, on December 7, 2012, Msgr. Gänswein was raised again – this time to be Archbishop, leaping over the rank of Bishop – and named Prefect of the Papal Household. John Paul II was often criticized for employing favoritism after he elevated his secretary Fr. Stanislaw Dziwisz to Bishop and the position of Adjunct Prefect of the Papal Household. He exercised that function together with the American Bishop James Harvey. Benedict’s bolder action, however, goes far beyond that precedent: Ganswein bounded to the position of Archbishop and Prefect of the Papal Household, which he will manage at will without sharing decisions with any more experienced person. No wonder many serious Vatican officials are unsettled. This was not the only case to raise eyebrows. In July 2012 Benedict had already selected the Bishop of Regensburg Gerhard Müller to become Prefect of the powerful Congregation for the Doctrine of the Faith and gave him the immediate rank of Archbishop. 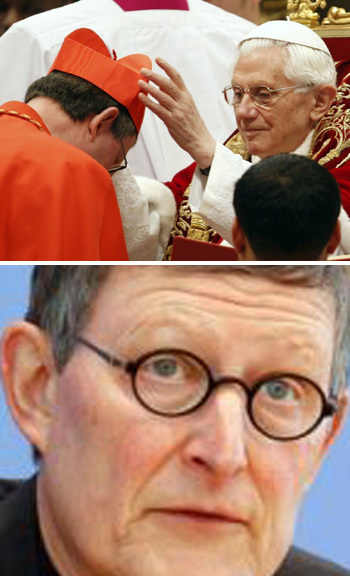 It is expected that soon he will be cardinal to fit that elevated position. Quite understandably, this caused concern in many circles since the Prelate in charge of being the arbiter of orthodoxy of all the other Roman Dicasteries and institutions of the Church, should have an indisputably sound Catholic doctrine. This is not the case of Bishop Müller, who denies the dogma of perpetual virginity of Our Lady, affirms the transubstantiation is not the actual Body and Blood of Christ, but must be understood in an “anthropological way,” and admits that salvation can be found in false religions. He is also an ardent adept of Liberation Theology, a movement that, along with its Marxist tendencies, is riddled with dogmatic and moral errors. 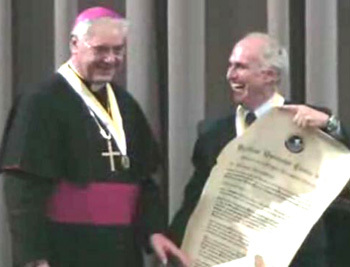 With this suspect doctrinal background, why was Bishop Müller chosen for that elevated position? The most probable answer to this question is that he has become a kind of theological secretary of Card. Joseph Ratzinger. Müller took the initiative of publishing all of Ratzinger’s works in a large, prestigious collection. This compilation seems meant to give Ratzinger the same intellectual calibre as a von Balthasar or a Rahner. Such an exaltation seems to have flattered him a great deal. Thus as a token of his gratitude for Müller’s undertakings, Benedict would have awarded him with nothing less than the control of the Congregation for the Doctrine of the Faith. Indeed, in the Renaissance many Popes fell into the vice of nepotism. Nepos in Latin or nepote in Italian means nephew. Nepotism stands for the unwarranted promotion by Popes and high ranking Prelates of their nephews or other family members to elevated positions in the Church. I believe that the paradigm of this bad behaviour was established by Pope Alexander VI, who named as a Cardinal his own son, Cesar Borgia. The name nepotism can be applied by extension to those Popes who promote their friends to high positions in the Church because they are dear to their hearts. Let me close with some related questions: With so many Germans taking on high positions in the Vatican and with the increasing “internationalization” of the Curia, we are hearing fewer and fewer Italian Prelates speaking for the Holy See. Does this departure of the Italians imply a change in the nature the Catholic Church, which is by nature Roman and, therefore, Italian? Or let me apply this metaphor: How much acid can we pour in the wine without changing it into vinegar? Can we indefinitely add water to the wine without changing it into a refreshment? To what degree can a wine become acid or be watered down before it ceases to be wine? To what degree can the Roman Curia be Germanized or internationalized before the Roman Catholic Church becomes something different? THE ICONOCLAST ASSAULT CONTINUES - Many of us remember how sacral and solemn the Churches were before Vatican II. Then, under the pretext of changing the Mass, we experienced a true iconoclastic phase of destruction of all that we loved: the central altars with their tabernacles and altar rails, the side altars with their statues, pulpits and confessionals, the thuribles with their incense, the small Communion bells and the large bells in the towers, and many, many other things that reflected the venerable bi-millenary tradition of the Catholic Church. Who planned that destruction? Was it per change a heretic Emperor such as Leo the Isaurian in the 8th century? No, this new Iconoclasm was commanded by someone higher than an Emperor; it was directed by a Pope. Paul VI ordered it and then carefully oversaw its execution. We wept, we complained, we protested. But because of our natural respect for the papacy, it took a long time for us to identify the real architect of that destruction. That first phase of Conciliar Iconoclasm ended around 1975. From then on, no new churches were built that did not follow the prescribed modern and extravagant style. Our beloved traditional churches remained, stripped of symbols, desecrated; nonetheless, they were still there to receive us for prayer and to host Masses. The migration of the Catholic population from one area to another in the city. When we read the diocesan reports explaining why they are closing or demolishing churches, these are the most frequent pretexts. The best evidence that these are only pretexts and not the real cause for this course of action, is that in places with many Catholics with lots of money, such as Berlin and Vienna, the Cardinals are closing the churches at the same speed or even faster than in cities like Boston, where Card. O'Malley gives all these different pretexts to justify the same unjustifiable policy. This policy, which was already moving in fast speed under JPII, is now further accelerating under Benedict XVI. We are witnessing, on the one hand, his promises to conservatives to return to a more palatable New Mass, the hybrid Mass, and, on the other hand, his encouragement of his closest disciples and new cardinals to proceed with the final destruction of churches all over the world. An online dispatch from Catholic News Agency (January 21, 2013) illustrates this state of affairs by describing the situation in Berlin regarding closing churches. Six years ago Card. Georg Sterzinski closed half of Berlin’s 210 parish churches. In a January 16, 2013, interview, the new Cardinal of Berlin, Rainer Woelki, revealed to the public his plan to reduce the remaining 105 churches to no more than 30 in the next seven years. What pretexts are being given by the Archdiocese of Berlin? Woelki alleges “the future process of population decline,” as well as insufficient funds and the personnel shortage. He goes on to say that in those remaining 30 churches the priests will be released from administrative tasks, with more laymen taking them over. He also reported that the diocesan schools, hospitals, nursing homes for the elderly and nurseries will be reduced as well, to reflect the “diaspora experience” the Church must undergo. This expression diaspora experience seems to give a tip to the agenda of the progressivist Church. All this destruction of churches is to create a mentality in Catholics that we are weak and should live dispersed, gathering in small groups in houses or other places, but no longer in the large old majestic churches. This is the ideal of Progressivism dreamed of by many of their leaders – to transform the Catholic Church into an assemblage of spiritual soviets, giving the Church a communist structure.